These stuffed lettuce cups make a great appetizer or perfect hot weather finger food, and they deliver a real taste of China. Ground chicken, mushrooms, scallions and water chestnuts are stir-fried with fresh garlic, ginger and chili, and seasoned with a trio of classic Chinese flavorings — toasted sesame oil, soy sauce and oyster sauce. Once the mixture cools slightly, it’s spooned into crisp leaves of iceberg lettuce. The burst of flavors and textures are amazing. The refreshing crunch of the water chestnuts and lettuce, the warm and juicy chicken and mushroom filling, and the delicious oriental seasonings are all wrapped up in wonderful edible parcels. While we’ve used minced chicken in this recipe, you can make the san choy bow filling with ground pork instead (preferably lean), or ground turkey. We’ve also done a really tasty version with crumbled firm tofu. You could use fresh or dried (and reconstituted) shiitake mushrooms instead of the button variety. And you could add fresh cilantro (coriander) leaves and some toasted sesame seeds as a variation. The filling mixture itself also makes a yummy meal tossed with cooked noodles. 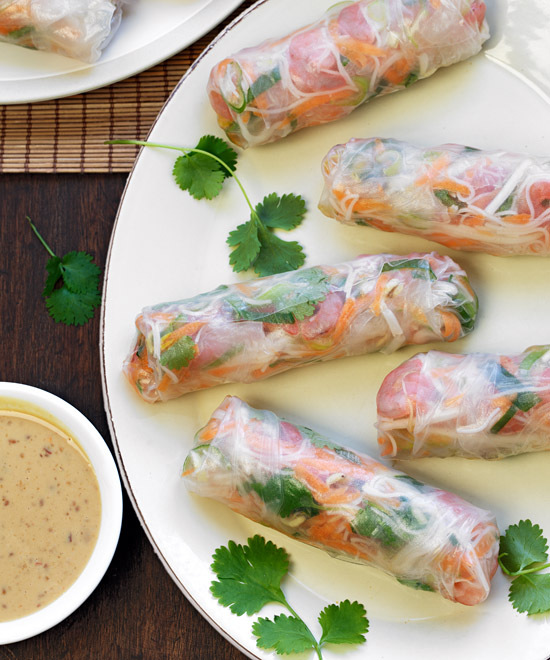 Or wrap the chicken mix in softened rice paper with bean sprouts and serve with hoisin sauce for dipping. We like to serve the lettuce cups on a platter, with each leaf already filled with a couple of heaped spoonfuls of the chicken mixture. But you can also put the filling in a bowl in the middle of the table, along with the lettuce cups, and let everyone help themselves. 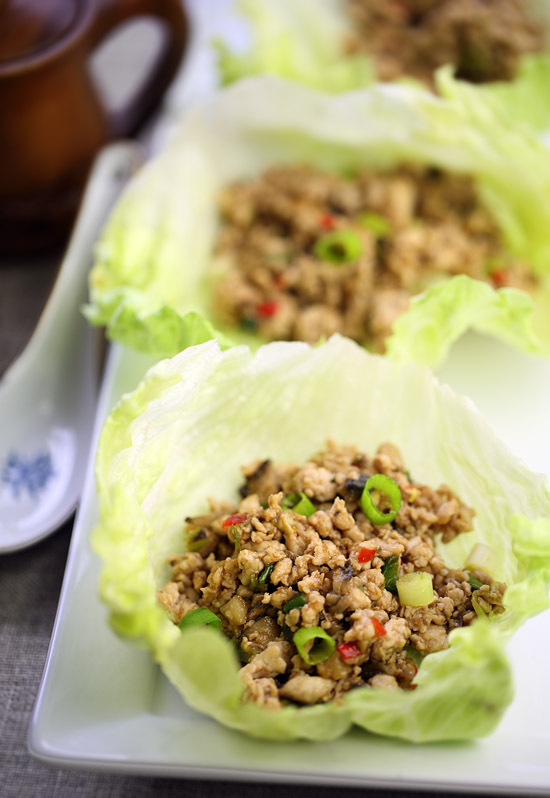 Lettuce cups filled with delicately seasoned stir-fried ground chicken, mushrooms and water chestnuts. 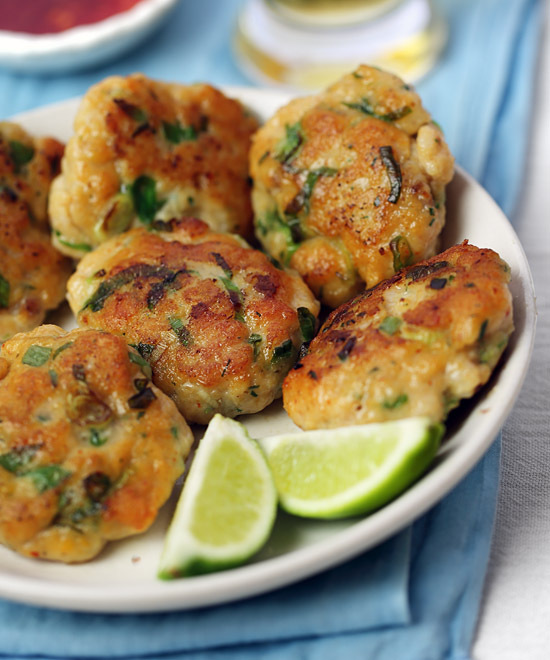 Makes a great appetizer or perfect hot weather finger food. CUT the base off the lettuce, discard the outer leaves then separate the whole leaves and trim them into cups. MIX together the oyster sauce, soy sauce and sesame oil in a small bowl. HEAT a wok or large frying pan over high heat then add the oil. STIR-FRY the chicken for 3 minutes, breaking it up as you cook. ADD the mushrooms, scallions, water chestnuts, garlic, ginger and chili and stir-fry for 2 minutes. ADD the sauce mixture and stir-fry a further 2 minutes. REMOVE from heat and allow to cool a little, then spoon mixture evenly into prepared lettuce cups and garnish with extra scallion to serve. Variations: Use ground turkey or mashed firm tofu instead of chicken. Garnish with fresh cilantro leaves and/or toasted sesame seeds. Use fresh or dried (and reconstituted) shiitake mushrooms instead of button.